Indeed, most of us seem to expect spotty service, ridiculously scrolly pages, multiple clicks to accomplish one step in a process, and limited functionality all around. Why? And for how long are people going to put up with this? 1. In a typical first step in usability testing, Interpix recruited users from a variety of backgrounds to provide a good survey of the interface’s market. While this group was necessarily skewed toward younger users, there were some interesting things they told us in pre-test interviews. Notably, they let us know that they were not interested in call centers and extended searches for help. Since the website was intended to be a self-serve portal, it had to function close to perfectly or allow these users to find their own help. Call center usage is probably more common for older users. Even though a mobile phone would seem to make this easier, the younger users in our test group told the consulting team they felt “stupid” asking for help, they found it intrusive and annoying, and they expected interactions to be independent. 2. Next, Interpix gathered data from these users through interviews. As this group was younger, they tended to think that problems with the interface’s initial design were their fault. And they tended to expect the design and layout to be faulty. Having seen this in usability testing before, the team probed deeper to find out how the interface could be easily improved. The average age of mobile users also presents other unique issues. One thing discovered was that many of them had accounts paid for by their parents. So in terms of usability, the interface needed to account for interruptions where the user may need to acquire parent’s consent. Or the interface could even account for this through a link that allowed them to call for help from their contact list, while simultaneously not losing any data they had already input into an interactive form. 3. The usability consulting team reviewed data and reiterated the interface to be more friendly. The mobile account users particularly liked summary data giving them important information about their account such as minutes left and other immediately useful information. 4. The design team implemented the improvements and retested to ensure that users were satisfied. While a complete cases study would take much longer to outline, we want to show here that the process of usability testing needs to be revisited by mobile developers. 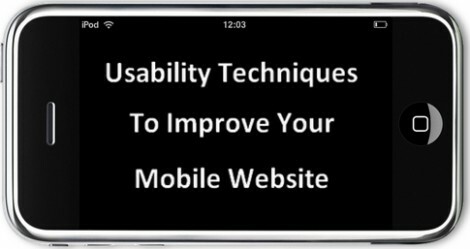 In usability consultants’ burgeoning experience with mobile usability, many have seen that mobile seems to have reopened usability issues that might have previously thought to be history. For example, should developers change the user experience for different platforms and to what extent? What if users do not know how to fully use the devices for which you are building? If so, should you help them learn and how do you account for different users’ abilities? A simple question: should your pages scroll top to bottom or left to right? Interpix’s experience with mobile usability design so far has showed us that our past experience with user testing and user experience design may have a whole new meaning, in the age of mobile. This is a guest post by Jim Huinink, a web publisher who works with a variety of websites and companies in the Toronto area, including specialists in mobile usability, Interpix Design.